Visual perception refers to a set of skills used to collect and interpret visual information taken in from our environment. 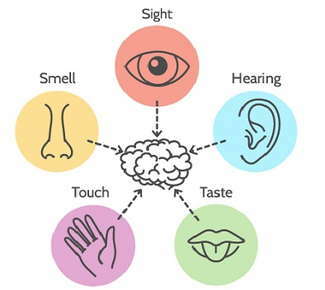 The visual information gathered is combined with our other senses, allowing us to derive meaning from what we see. Through the process of merging visual data with our other senses, we are also able to organize eye and physical movement. For this, visual perception is critical when it comes to our ability to learn, move with ease and understand the world around us. Seeing begins with the lens of the eye focusing an image onto the retina, a light-sensitive membrane located in the rear of the eye. The retina contains cells called photoreceptors, and they translate light into electrochemical signals that journey along the optic nerve fibers to the brain. When the signals reach the brain, they are read as vision in the visual cortex and the brain puts meaning to what is being seen. Just as the eyes send signals to the brain, the brain also sends signals to the eyes, ultimately controlling their movement. And as we are aware, the brain additionally releases signals to other organs, muscles and nerves throughout the body, controlling their movement as well. Through the aid of visual therapy, this dysfunction can be corrected with a mix of vision exercises and specialized equipment that train the visual system to work in coordination with the brain and other senses. Therapy is guided by an optometrist and is performed in an office once to twice a week for up to an hour. The types of exercises and equipment, as well as the number of sessions required, will depend on the individual needs of the patient. To supplement office visits, the optometrist will likely give the patient instruction on how to perform certain vision exercises at home. Following the completion of vision therapy—meaning all necessary sessions have ended—the individual should be able to coordinate eye and physical movements, their visual capabilities should have improved and there should be greater efficiency when it comes to processing and interpreting visual information.